It was an up and down week for me. Wednesday was especially difficult, one of those days you kinda hate yourself, for no good reason, probably. All it takes is a few things to go wrong in succession and suddenly all you've done to be who you are seems insignificant compared to who you are not. To the point where, when the Nurse Practitioner for your physical exam asks, "Have you had a sense of dread, hopelessness or depressive thoughts in the last week?" and you hesitate for three full seconds before lying and saying "Nope." Of course these thoughts are stupid and unfounded and a waste of energy, but that doesn't mean they don't happen from time to time. All it takes is someone ridiculing you at work or an eye roll coupled with snide sarcasm to bring you question your worth. You know that it is only an indication of the person's own personal weakness or insecurities, but that doesn't always help. But because I hate being in that place, I always manage to pull myself out of the self-wallowing mire. I attribute the incidents/funks to being "just a bad day" and try and make the next day better. So the week finished out much better. It was capped off by a vacation day on Friday where I went fishing - alone. This is always a time for me to regroup, reflect and recharge. There is something about that kayak and fishing on my favorite lake that puts things back to right. The fishing was fantastic which helps. If you know me, you know material goods don't matter to me. I don't care for the status of "things." But I will say that my kayak is a source of great joy for me. I love everything about it, but mostly the sense of freedom it gives me. It's like a poor man's Harley Davidson. 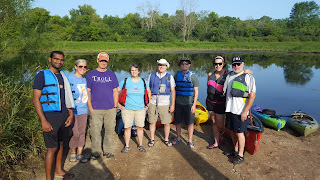 To make the weekend even better I went kayaking again - with friends this time - on Saturday. 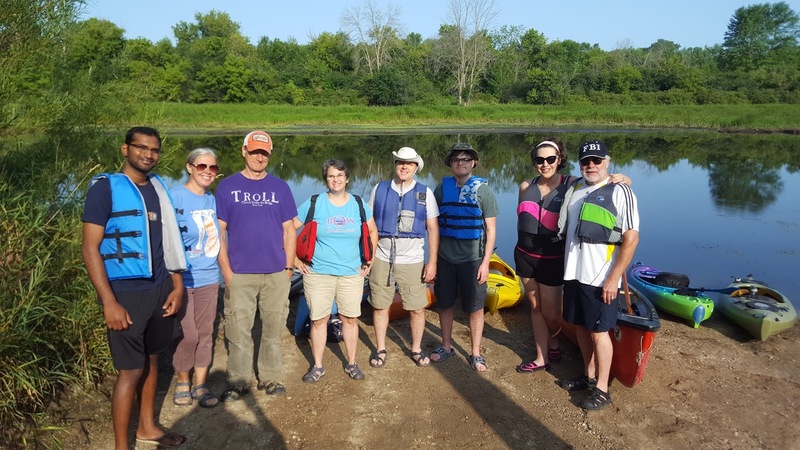 A group from our church, Collective MKE went out and kayaked the Fox River. The levels of expertise varied from novices to expert, but one thing was sure, everyone was happy to be there. We enjoyed each other's company, took in the wildlife we saw, and laughed really hard at times. And it occurred to me that these people are my tribe. They are the ones who have my back. They build me up, encourage me and expect the same from me. I figure, like me, they have days where they hate themselves too. But also like me, they are able to sleep it off and attribute it to a crappy day. I hesitated to post this, as I like to keep all my posts positive. At the same time though, I think people need to be honest about what they're feeling from time to time. I have great compassion for those who suffer from depression, because I see where they get it. And I give them great credit for working through it or getting help. It's nothing to mess around with. I am fine, but I know others that aren't. Furthermore, it serves as a reminder to check what you say to people when you go through your day. Bringing people down serves no good purpose. There is a Facebook meme that reads: "Be sure to taste your words before you spit them out." I think that says it well. I know people hate it when people say things about being blessed, but I can't think of a better way to describe my friend network. I am blessed by the people of Collective MKE and can't imagine doing life without them.